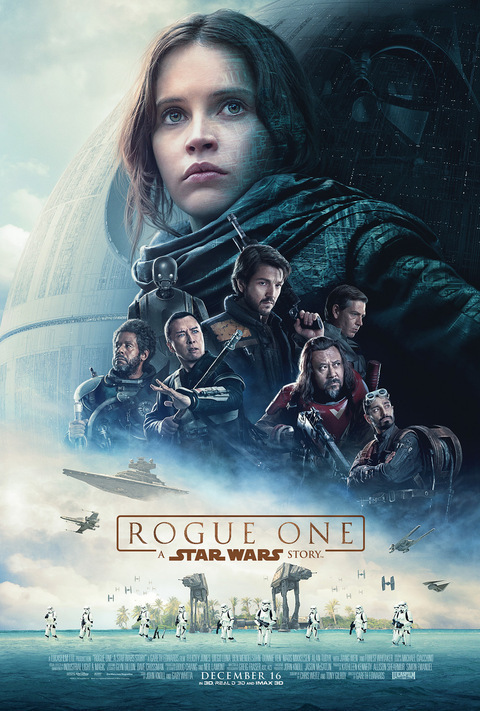 This second installment in the revived Star Wars franchise doesn't really need a review, nor anyone's critical comments for that matter, but it does deserve recognition for its faithfulness to the continuity of the storyline, even though it is a preface to the prequels. And it also rates high praise for monumental visual achievement. The most gratifying outcome of the two new Star Wars movies released in the last two years has been faithfulness to the storyline, even though the stories are original and fresh -- and the scripts are enhanced by the introduction of new characters who are just as intriguing as Luke, Leia and Han . . . if not more so, especially Jyn Erso, played by Felicity Jones, yet another of the strong female leads that this revitalized franchise is bringing us.. The script is also further enhanced by the resurrection of older characters played by actors long since dead, such as Peter Cushing who died in 1994, returns in CGI form to convincingly reprise his role as Grand Moff Tarkin, complete with his high-cheek bones, over which are draped sunken cheeks. His virtual cameo reminds us long-term fans that he was the commander of the Death Star in the early Star Wars episodes. Even the battle-scarred droid, K2SO manages to get off some choice wisecracks without having to mimic the twit C3PO, who we see ever-so-briefly, complaining that "nobody ever tells me anything".